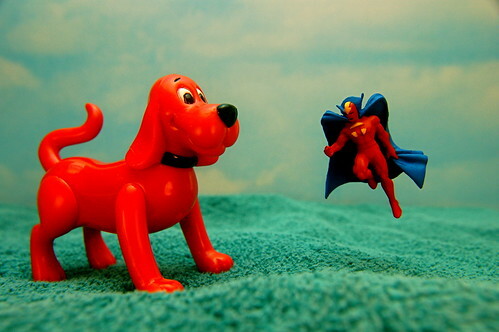 Clifford the Big Red Dog vs Red Tornado, by JD Hancock, on Flickr. Recently I found myself in the offices of Scholastic, the children’s publisher best known for K-12 book fairs across the country and Clifford, the big red dog. They are conducting a massive educational software launch this week, with both new and updated products for reading and math from kindergarten through high school. Margery Mayer, president of Scholastic Education, shared her inside views on the state of the industry and the potential makeup of the growing market for blended learning going forward. Right now, educational software is included under “supplemental materials” in school budgets. Last year for the first time, digital resources surpassed printed worksheets within that segment of spending. In the years to come, we’re likely to see the convergence of textbooks, assessments, and supplements, leading to a total $9.1 billion annual market fulfilled largely by educational tech. That’s a lot of iPads. In parallel with the move from digital to print, Scholastic’s move from storybooks and magazines for students into the educational software market is part of a process of convergence, consolidation and upheaval in the industry that leaves unanswered who will ultimately provide the bulk of these products to students. They are betting that they can hit the Goldilocks spot, having both the brand recognition and trust with teachers of the bigger players, along with room to innovate, and the runway to develop brand-new offerings from scratch without needing to come to profitability quickly or be acquired as startups do. The period of real transition has just begun. “The structure of the industry is already changing,” says Mayer. “Five years ago there were a lot more large textbook publishers. You’ve seen a round of heavy acquisitions at Pearson”–the largest educational publisher in the world. Last month, McGraw-Hill spun off its education business to Apollo Group, which operates the University of Phoenix, for $2.4 billion, creating another huge publicly traded entity with roots across educational technology. The Bill & Melinda Gates Foundation (which is one of numerous funders of The Hechinger Report) has invested billions in technology. Charter schools like Summit and Rocketship Education are piloting and promoting the integration of tech and teaching, and even developing their own technology in-house. The Khan Academy is a nonprofit startup with mass adoption and household name recognition. Apple, with its iBooks textbook platform and large ecosystem of educational apps, Amazon, with its Kindle Fire and Web Services for Education, and Google, with Google Apps for Education, have been named as having potential interest in acquiring education startups. Incubators and venture capitalists are seeding the burgeoning educational startup movement. NewsCorp, with its Amplify Learning brand, (seeded with the $360 million purchase of Wireless Generation back in 2010) is the newest entrant and the first to market both devices and curricula in parrallel.